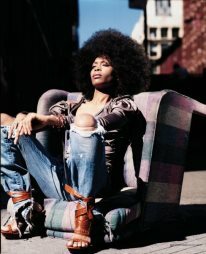 Grammy award-winning American singer Erykah Badu is slated to perform in Nairobi, Kenya on December 11. Tickets will cost Kshs 4,000 (~$47) for regular and Kshs 7,500 (~$88) for VIP entries. Last month there was a bit of debate about the reception of international concert stars who perform in Nairobi. @KenyanPoet wrote about the live concert business and the value Kenyans give it noting that, while the James Ingram concert in Nairobi attracted 500 fans, a Rick Ross concert in Tanzania attracted 22,000 fans, and Konshens in Uganda drew 25,000 fans. The taxes: Immigration, Kenya Revenue, Lands Office, Environment office, Security, Information – everyone (at) these Ministries want a piece. The Kenyan government then requires the promoter to show a contract between artist & promoter. They take 10% of that fee, and this must be paid in advance. The promoter must then pay Immigration for special work permits. That’s 25,000 (~$295) per member of an entourage – paid in advance. The promoter must then print the tickets and go back to KRA to stamp them. They also tax 10% of the ticket. After paying all these, the promoter must comply with environmental law and pay that noise tax…..I know you already have a headache and promoter hasn’t even paid for the venue which is hectic. Then security, publicity, transportation…by the time any sane person has paid taxes worth their whole investment, some of you will already be retired. So don’t blame promoters. Finally – The promoter who brought Sean Paul and Wayne Wonder ran outta business. Losses galore. We trust that the promoters of the Erykah Badu concert won’t go out of business..or incur a loss. Her concert is sponsored by giant brewer East African Breweries’ @TuskerLite brand. She’s a world-famous artiste who has toured extensively and has a strong track record of award-winning songs like Window Seat, On&On and Tyrone – and the promoters should come out ahead if marketed right. Still, it should be easier to bring more international acts to Kenya. EDIT: Apparently, promoters of other US stars including Keri Hilson and Chris Brown are also scheduling concerts for December 2012 in Kenya. This entry was posted in EABL, Kenya taxation on November 15, 2012 by bankelele.